Marian Lorenz Groff '59 and her husband Jerry lost their home of 46 years in Montecito during the Tea Fire of 2008. "It exploded like a volcano on the hillside behind our house," she says. "We had less than an hour to evacuate." They left behind countless heirlooms such as rings that belonged to their mothers, hand-painted china and family photos, as well as important documents including their will. But they rebuilt their home on the same site. "We've lived with the threat of fire for many years, having escaped 6 of them," Marian says. "My two children grew up there, and it's still our home." Fellow members at Santa Barbara Community Church donated clothing and household goods to help the couple recover. "We were overwhelmed by love, generosity, cards and phone calls from friends at church and Westmont," Marian says. In May 2009, she celebrated her 50th reunion and marched at Commencement with her classmates as Golden Warriors. "I loved my years at Westmont," Marian says. "I'm proud to be a graduate." She participated in the college's first summer mission trip, when students went to Hawaii to work with churches and Youth for Christ. "That experience gave me a heart for missions," she says. Once he retired from his optometry practice, Jerry traveled for many years on the Westmont student-led mission trip, Potter's Clay, to Ensenada, Mexico, to provide free eye exams and pass out donated glasses. For 15 of those years, Marian joined Jerry as a volunteer. An education major, Marian spent 20 years teaching at Cold Spring School. She also helped start a preschool for low-income families in Santa Barbara. Her son, Michael Thompson '88, went to Westmont, as did Marian's sister and two nieces. Michael works as an engineer in Oxnard, California. Jerry didn't attend Westmont, but he shares Marian's enthusiasm for the college, being "groffted in." The Groffs contribute to the Westmont Fund and belong to the President's Associates. They've also provided for the college in their estate plan and are members of the Wallace Emerson Society. "We want to make Westmont available to all students," they say. Despite rebuilding their lives, their commitment to Westmont endures. "We know God will provide for us," they say. 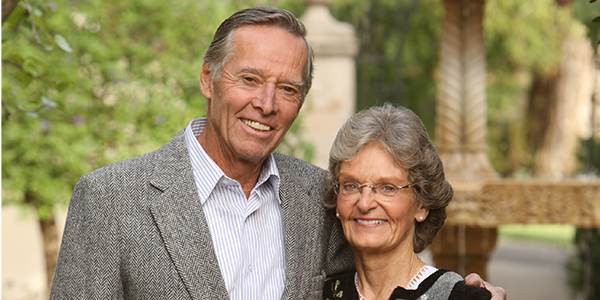 "We want Westmont's legacy and impact to continue." Reproduced with permission from the winter 2009 issue of the Westmont College Magazine. For more information about ways to include the college in your will or trust, please contact the Office of Gift Planning at (805) 565-6058 or giftplanning@westmont.edu.